Based on best estimates of cost per mile, so far we've funded 319.58 linear feet of wall. Please help us keep going! How many times have you heard someone suggest starting a GoFundMe for the border wall? That’s similar to what this project is, with several enhancements. First is that we are a 501c3 nonprofit, so your contributions are tax deductible. Second, we have found a legal way to get the funds directly to DHS and third, we are able to ensure they are only used for border wall construction. Every project that the Government does, large or small, is ultimately funded by the private sector, because the private sector pays the taxes that fund Government projects. It’s just a matter of how the government chooses to allocate our tax money. Sometimes our government makes good choices about what to spend it on, and sometimes it doesn’t. 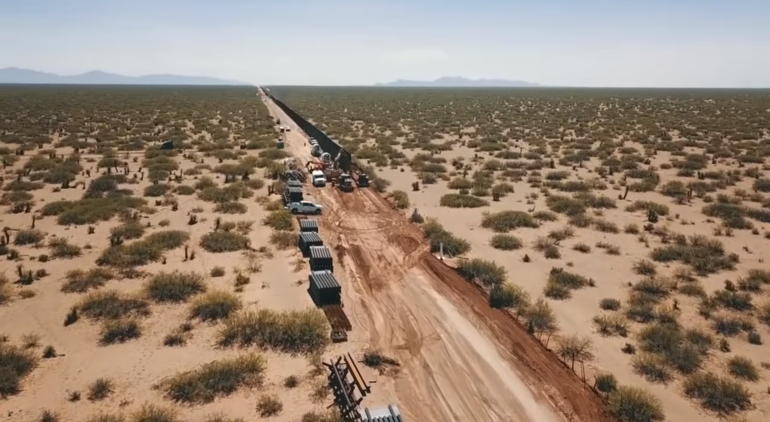 Border wall construction has been waiting for Congress for fund it for years. They seem to think it’s more about the political theater than getting something done. Nothing in the Constitution says private citizens can’t donate money to fund public projects; in fact it’s quite the opposite. That’s how hospitals, libraries, bridges, and college buildings, and lots of other projects end up with a person, family, or foundations’s name on them. Think of this program as a crowdfunding effort, with one specific goal: fund the border wall. If a private citizen wants to write a check for $8 billion, we’ll gladly forward it to DHS and call it a day. Unfortunately, that’s not likely. We’ll need to get there a dollar at a time, thanks to donations from people like you. Why wait? Americans contributed $410.02 billion to charity in 2017. 2018 will surely be even more. Generating $5B in contributions to border security for each of the next 5 years would comprise at most 1.2% of annual giving. We can spare it! Our process provides funds directly to DHS for use ONLY in constructing a border wall. The money is placed in a single account and sent to the Department of Homeland Security on a regular basis. Our first delivery to DHS will be for $100,000 and is already well in process. Operational security at the border includes a strong wall, and we as Americans can break the stalemate in Congress that’s existed since 2006. Mexico will reimburse the general treasury in one way or another, but if Congress won’t appropriate the money to DHS that doesn’t help anything. We need not wait for that reimbursement to start. We can deliver funds for DHS to use now to continue construction. We don’t have to wait until it’s fully funded for construction to begin. Prototypes were built with only $30m in initial funding. Every dollar helps, and the returns to the country are immeasurable. Please help us fund the US Border Wall today! Thank you US Sheriff's Association!!! Truly Remarkable United Movement of the People : Build that wall! Now more than ever, Americans must join to secure OUR God given Nation. Our Forefathers fought & died so that we may BE FREE. That freedom is now in jeopardy. If anyone has not donated, please consider this urgent call. Built that wall as one nation under God. God bless! Need wall for protect citizens, tourists and will be more easy job for military to control border. Keep having the Town Halls to share information about what you are doing, it will help to raise more money to get our wall built. I am so proud of you President Trump and I love you for everything you do. I do believe you are the chosen one and anointed by our heavenly Father. My grandfather imigreated from Germany in 1922. He did it the legal proper way. It was a pain, for sure, but he had a sponsor, got a job, paid taxes, and learned English. He loved this country and was grateful he could come. To my Commander in Chief. There needs to be a barrier. Look at the state all of Europe is in because of the refugee crisis. That's what you get with wide open borders. We have our children to think of and this administration is getting it done. MAGA PATRIOT FOR LIFE! Let's honor our men and women who sacrifice every day trying to keep America free and safe. Let us build this wall to keep our families safe. Ok. Everyone fund the wall . It is a good feeling. Anyone who is for a free and secure world should donate now. The Control of its border is one of the fundamental rights of an sovereign Country. We need this AMERICA FIRST! Time to get this done NOW! Please help the cause and save our great country! I made a small donation from UK. Lets build the wall - keep America great. We cant stand by and let Democrats destroy this great country ! Our future depends on a secure border. We are a Nation of Legal Immigrants, please come here the right way & plan to assimilate to the American way of life or fix your own countries. We can NOT support a Welfare Nation!! Thank you, I pray we can secure our borders. Protect our citizens from violence and lawlessness especially drugs and murders. If the Democrats in Congress won’t fund it we will. Imagine if all government projects we're opt-in/out! Thank you Brain for forging the way to protecting our citizens! Please everyone donate to secure and save our country from these American hating progressive freaks . We wont get another chance . This is it. We either do it or lose our country froever.Hod Bless America. Please keep my home save. I do not support Donald Trump. I do support border security that allows people to enter the U.S. legally. The wall won’t stop everyone but it will help. Cutting in line to get into the county I fought for is not allowed. United we stand- Devided we fall. Build the wall now. Make America great again. BUILD THE VWALL & KEEO AMERICA SAFE ! Tell a friend. Spread the word about this. The media won’t do it so we, “the people” have to do it. Tell a friend! No boarders = No country. The wall will pay for itself many times over, once it is built. Only seed money is required to create the wall. I am proud to do my part. I have so much faith that we the AMERICAN People can do this.On and upward!! God bless us all! Make America great again! Thanks for arranging this. I’m a big supporter of the wall and other ways to protect the USA. Why should we not support our boarders? This is a great way to build our wall which is so badly needed. Every little bit helps so make a donation today. I’d like to help keep my country safe when Congress and the Senate don’t think it’s important enough. Investing in my children future and safety. We cannot allow others to change our culture and commit crimes towards our ppl. Thank GOD for President Trump and VP Mike Pence!!! Praying for you guys and our great country to have wisdom and understanding as you navigate in these hostile and GOD less times. I may not have a lot of money, but I am sick and tired of waiting for Congress to do something. So, I decided to donate what little I can. Trump works for the working Americans and deserve our support. I wish everyone would give whatever they could and show the obstructionists what we meant when we voted for a wall. And then vote all of those that side with illegal aliens, not US Citizens, out of office!!!! Let immigrants in, but only legally!!! For the safety of our GREAT COUNTRY! God Bless America! In short. I’m a 65 year old retired patriot who lives, breathes, and eats American values. We have to and will stand with our President! Send the Dems a message (Fund the Wall)!!! Yes the Democrats are Hippocrates. Before Trump got in they wanted a wall. What. Hanged? We need this wall built. Supporting President Trump. I am so sick and tired of the democraps that I will NEVER vote for them again. Build the GD wall and keep us safe. The Democrats are idiots, the Republicans need to stand their ground. Build the damn wall already! I will continue to donate as often as possible. Unfortunately, I'm on a fixed income so I don't think I'll be able to compete with George Soros. However, I will do my best!!! it is a shame that this web site has to exist, THANK GOD IT DOES! fully supporting President TRUMP! Let's get this much needed wall built ASAP!! Please stress this is TAX DECTIBLE. Altho’ I cannot afford to do this, I am doing it for the benefit of ALL of us. Please send what you can afford. This is more than funding the wall, it’s sending a strong message to the swamp, that it’s about to b drained!!!! BTW - do the right thing for America. We’re praying for our president & our border wall! We NEED to remain a sovereign nation! That’s what makes us strong and GREAT! Lord, plz bless Pres.Trump. Get the wall built. Save American lives despite Schumer and Polish ! Americans together are strong BUILD THE WALL. We need to protect our country if we want one. Americans 1st. in America. GOD BLESS USA. Thank you President Trump, the people are behind you and praying for you. This is for America and for those who oppose you!! Merry Christmas America.